JOSEPHINE COUNTY, Ore. – Police arrested two people for burglarizing a home north of Grants Pass. Officers said on the morning of January 18, an alarm went off at a residence in the North Valley area. When deputies arrived at the home, they saw two men running away from the scene. After a short foot pursuit, police said they were able to take the suspects into custody. 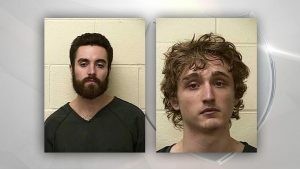 They were identified as 28-year-old Tanner Baine Sayre and 20-year-old Bryce Blake Widner. According to the Grants Pass Department of Safety, they found a car parked in the driveway of the home with items that were stolen from inside the home. Sayre and Widner were charged with burglary, theft, criminal mischief, escape and interfering with a police officer.